We get asked all the time how we find such great deals on flights, so we’ve decided to make a post about it. A trick we use to find cheap flights is checking what airports around us are cheapest to fly out of, and which destinations in the region we are interested in visiting are cheapest to fly into. The flight will likely be the biggest expense on your trip, so it’s important to find the cheapest options out there. Here is a step-by-step guide on how we find the cheapest flights for our trips! Open skyscanner. They have a great mobile app you should download so you can search for flights on the go! Enter a nearby airport (bigger airports tend to be cheaper) in the “from” section, and then type the city you want to fly in to in the “To” section. You may have to follow the steps below a few times, entering different airports in the “from” section if you live somewhere where there are many nearby to find which one is the cheapest to fly out of. For example, when we fly out of Florida we always compare flights from Orlando, Ft. Lauderdale, and Miami, as these tend to be the cheapest airports to fly out of. Click “One-Way” or “Roundtrip” at the top. One-way international flights are typically cheaper than round-trip flights. Plus, it allows you to fly in to one place and leave from another, without backtracking, which is perfect if you are hitting multiple destinations in your trip. In the Departure section, click “whole month” and enter the month you plan on traveling. We understand this won’t work if you have specific dates you plan to go, but if you have a more flexible schedule then this option is great because it lists the cheapest flights to any destination during the selected month!! You can click the calendar view to see the dates with the cheapest flights (green dots) or the dates with the more expensive flights (yellow and red dots). If you use to bar graph view, it shows you cheapest flight prices week by week. This is perfect for finding the cheapest flight (the lowest bar will indicate the cheapest flight). Hit “Search Flights” and browse dates/destinations. If you are planning on flying with someone else or in a group, go ahead and change the number of passengers to the amount of people traveling. This isn’t necessarily to compare price (unless you are purchasing all of the tickets together), but to ensure that there are enough seats on the flight for the amount of people you are traveling with. Keep in mind whether or not you are checking a bag, and if the flight doesn’t provide one free checked bag, book in advance. Airlines will charge you extra to book a checked bag at the time of departure. Moreover, note your destinations high and low seasons. These are the times when most visitors travel to the country (“high” season), and when there are fewer visitors there (“low” season). Prices for flights, transportation within the country, and accommodation are higher during the high season. For example, Europe’s high season is typically in the summer, but regions in the arctic circle (e.g. Iceland, Norway, etc.) will also have a high season in winter, as this is when the northern lights can be seen. There is great debate on the best times to purchase airfare tickets. We typically find the lowest prices 2 months to 3 weeks before the flight, but we have friends who have found ulltra-cheap tickets just days before their trip as airlines drop prices on flights that haven’t been filled. However, we always book our flights at least a month in advance, and preferably 2 months in advance, in case the price ends up shooting up at the last minute. This way we don’t get stuck having to pay a ridiculous amount for a flight we saw was much cheaper just weeks before. Thus, we don’t recommend waiting until the last second to book your flights. This method only works for those spontaneous “Hey, wanna go to the Bahamas this weekend if we can find a cheap flight? !”-type situations. 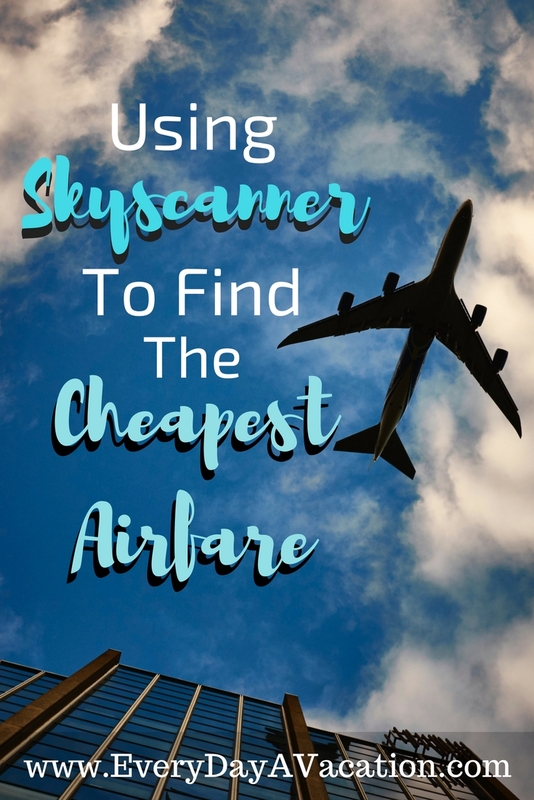 We hope this article helped walk you through using Skyscanner to find cheap plane tickets! Also, although we use Skyscanner 99% of the time, it’s worth noting there are some other helpful apps to find cheap flights. Hopper, DealRay (provides alerts on cheap flights), Skiplagged (accounts for hidden-city tickets, like if you’re trying to get to LA, but it’s cheaper to buy a plane ticket to San Francisco that has a layover in LA), and TravelPirates (ultra cheap hotel and flight packages) are some other great sites to find flight deals.